The Hump's parent company is charged with the illegal sale of a marine mammal product for an unauthorized purpose. Los Angeles, California (CNN) -- A trendy California sushi restaurant charged by federal authorities with serving whale meat offered an apology Monday, saying it "ignored its responsibilities" to endangered species. Prosecutors charged Typhoon Restaurant Inc., the parent company of Santa Monica's The Hump, and chef Kiyoshiro Yamamoto, 45, with the illegal sale of a marine mammal product for an unauthorized purpose. Although it is considered a delicacy in Japan and some other countries, meat from whales -- an endangered species -- cannot be sold legally in the United States. "We write to address the misdemeanor charge recently filed by the U.S. attorney," the restaurant said in a statement posted on its Web site. "The charge against the restaurant is true: The Hump served whale meat to customers looking to eat what in Japan is widely served as a delicacy," the statement continued. "In serving this meat, The Hump ignored its responsibilities to help save endangered whales from extinction and failed to support the world community in its uphill fight to protect all endangered species." The restaurant pledged to set up procedures to ensure that it complies with laws and "becomes a good corporate citizen." "We sincerely apologize. We pledge to work hard to re-earn the trust of the public and respect of our customers." The misdemeanor charge carries a federal prison sentence of up to a year and a fine of up to $200,000 for the company, said Thom Mrozek, spokesman for the U.S. attorney's office. 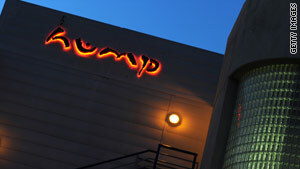 The law firm for the restaurant and its parent company deferred questions to The Hump's Web site. However, Typhoon attorney Gary Lincenberg has said the restaurant accepts responsibility for serving whale and will agree to pay a fine, CNN affiliate KTLA reported. The investigation into the restaurant began in October, when two members of the team that made the documentary "The Cove" visited The Hump, officials said. "The Cove," which exposes the annual killing of dolphins at a Japanese fishing village, won the Academy Award for best documentary this month. Armed with a hidden camera, the two women captured the waitress serving them whale and horse meat and identifying them as such, a federal criminal complaint said. A receipt from the restaurant at the end of the meal identified their selection as "whale" and "horse" with the cost -- $85 -- written next to them. The sei is found throughout the world's oceans. Whalers began to hunt them after the populations of right, humpback, blue and fin whales declined due to overfishing. It is now considered an endangered species. In February and March, the activists returned and again asked for -- and were served -- whale meat, the criminal complaint said. A DNA test of the meat smuggled out after the February visit confirmed it to be meat from the sei whale, Mrozek said. During a final visit in March, officials with U.S. Customs and Border Protection, the U.S. Fish and Wildlife Service and the National Oceanic and Atmospheric Administration observed the activists asking for "kujira," or whale meat. One of the officers then saw the sushi chef leave the restaurant and return with a wrapped package that he seemed to have retrieved from a parked Mercedes, the complaint said. The chef told a customer it was whale meat, the document said. Next, officials raided the restaurant, and chef Yamamoto admitted that he had served whale meat, the complaint said. "Someone should not be able to walk into a restaurant and order a plate of an endangered species," U.S. Attorney Andre Birotte Jr. said. Conservation agencies are engaged in an ongoing feud with Japan over whaling. In the early 1980s, the International Whaling Commission determined that there should be a moratorium on commercial whale hunting. However, whaling is allowed under international law when done for scientific reasons, which Japan cites as the legal basis for its hunts. The country's annual hunt kills up to 1,000 whales. Many in the international community believe that such hunts amount to needless slaughter.